-Took rid of the already mentioned anti-cheating measurement. -Fixed issue with the game crashing on RockCube air-push against some enemies. -Fixed NaviCust tutorial entering infinite dialog loop on an incorrectly place NaviCust Part. -Video filters should now work the way as intended. -Tornado chip's range in multiplayer is now correct. 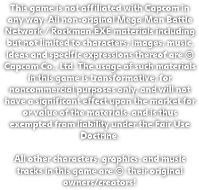 -Fixed MegaMan entering infinite message loop when player picks up StampCard exactly as the prelims timer runs out. -Fixed bug with walking NPCs still playing walking animation when interacted to. -Fixed the crash when player tried to bring Mr.Prog from Airvent Area 2 to 1. -Fixed NaviCust parts disappearing when quitting NaviCust without run. -Fixed clipping bug with stairs at SciLab. -native support for analog sticks (as a workaround, use Steam Big Picture to configure the gamepad).